Some call the subgenre “alternative Christmas,” as it’s a subgenre of Christmas movies that tend to eschew the saccharine good times most frequently promised by treacly holiday fare in favor of violent action, horror or gore. And while many audience members get a full-blown yuletide charge from films like Die Hard and Black Christmas, such films are meant to function – on a basic structural level – as satires of Christmas sentimentality. Tired of the same old syrupy, weepy positivity that infuses the season? Bitter at the actual bustle of Christmas? Depressed by it all? Pop in Bad Santa or The Long Kiss Goodnight, and let the juxtaposed darkness comfort you. Joe Dante’s 1984 film Gremlins is one of the more important Christmas satires to Generation X and Generation Y, effectively turning out a feature that is equal parts hilarious, terrifying, and, most importantly, wry. 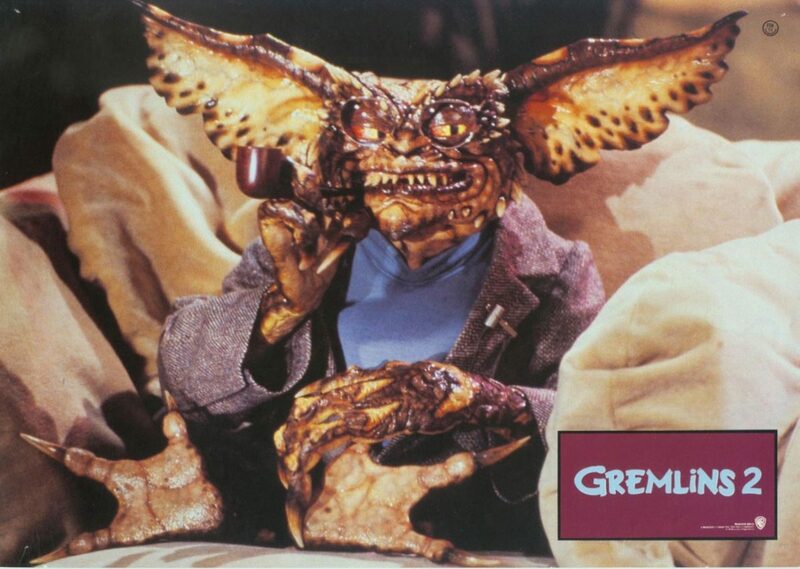 Gremlins is one of the more effective – if blunt – satires of the pop landscape of the 1980s. Dante sought to take the treacle of It’s a Wonderful Life and remix it, as it were, with the monster matinees of his own youth. The film features a constant barrage of references to films like The Time Machine and Invasion of the Body Snatchers. The central joke of Gremlins is that of satire: This is a Christmas film that has been invaded by the monster film from the theater down the street, undoing all Christmas good feelings, replacing them with slime. The less-lauded, but in many ways superior, Gremlins 2: The New Batch (playing at the New Beverly on December 23rd), takes that satire, and expands it to an absurd degree. 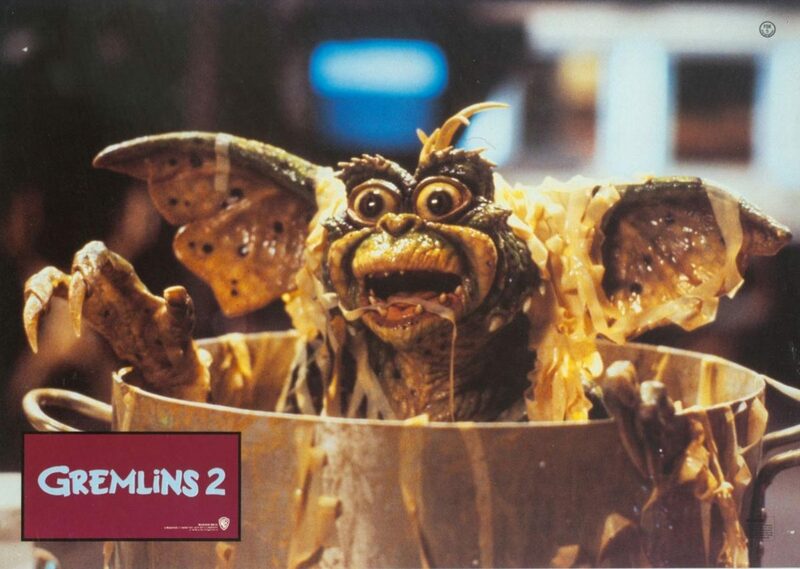 If Gremlins was a satire of Christmas movies, then Gremlins 2 is a satire of all cinema. It is a fourth-wall-breaking explosion of bedlam that has more in common with the hyperactive monster-loving milieu of a sugar-addicted 8-year-old boy than it does any sort of typically sane creature feature. If the original was spiritual successor to Invasion of the Body Snatchers, Gremlins 2 is a direct descendant of Looney Tunes shorts. Indeed, Gremlins 2 begins with a deliberate false start featuring Bugs Bunny and Daffy Duck arguing over who gets to star in the film’s accompanying cartoon short. That they never actually get to the short (it’s cut off by the title card). This is going to be a film of chaotic false starts, weird plot conceits, and innumerable references to other monster movies. This is a Warner Bros. film that will feature prominent Warner Bros. iconography, including the Batman logo and the “WB” shield itself tattooed on the body of a small evil monster. This self-reference is, of course, cheeky humor at its finest, but it also belies an unexpected and subversive mission statement from a film this silly: Cinema is over. The creatures in Gremlins 2 are not just movie monsters, but self-aware agents of chaos that seek to dismantle all order within the cinematic firmament. Like the Looney Tunes before them, they look at reality, chuckle to themselves, and riff on it like a jazz musician. 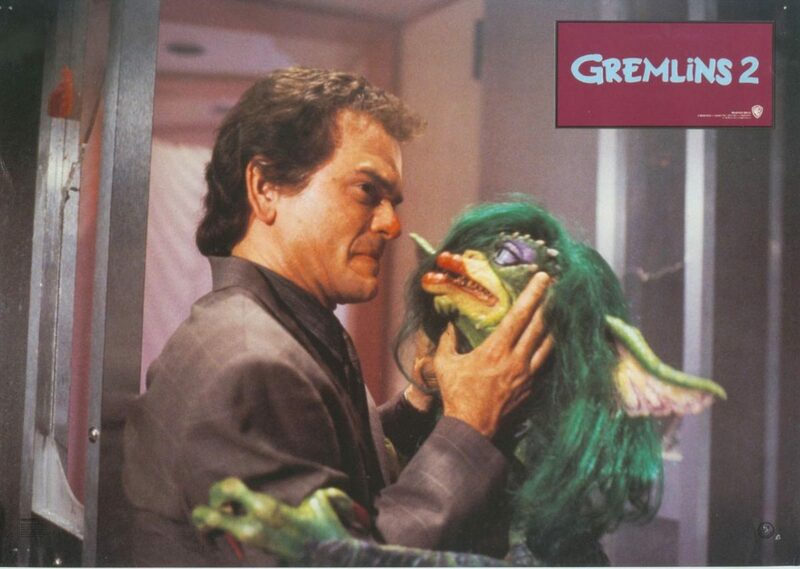 Classic creature film is largely dead in the universe of Gremlins 2, relegated off to the side, vaunted only by an aging TV horror host who seems to resent his passions for monster movies. It is like the quaint flower shop on the street corner in Jacques Tati’s Playtime. It is the last tiny scrap of earnest homey rural bliss in a world constructed of concrete and steel. 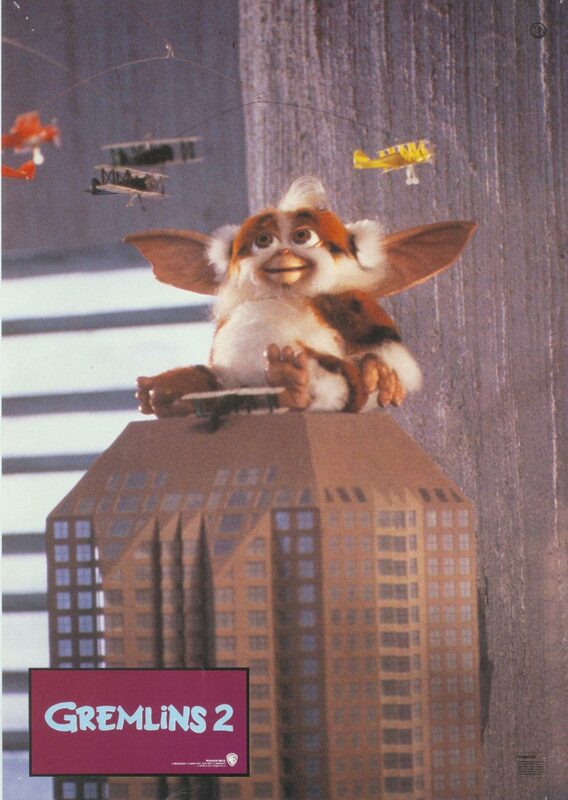 I should perhaps mention that Gremlins 2 takes place almost entirely inside a monstrous urban supertower replete with all of the world’s latest technology, and home to a mall, restaurants, a TV studio, and several small businesses unto themselves. It is modernity incarnate. Wealth run amok. It is called Clamp Tower in reference to a clownish businessman from the 1980s and 1990s who has recently re-entered the public eye. That Gremlins 2 was yet another venue to openly mock such a person should prove to be suddenly salient at the end of 2016. The gremlins themselves seem to have taken a step back from the original 1984 film, coming to mock the very monster films they originated from. They watch monster movies, and laugh at – not with – them. Film criticism is dead too; in a self-aware gag, the gremlins can be seen murdering veteran film critic Leonard Maltin in the midst of his (perhaps notorious) pan of the original Gremlins. They strangle him with a strip of 35mm film. Your love of cinema cannot save you from the immature shenanigans of these monsters. And, in the film’s funniest and cleverest sight gag, we also learn that film presentation is itself dead. There is an artificial film break halfway through the film, and the white screen fills with the silhouettes of gremlins, chewing up the filmstrip, making shadow puppets, and, presumably, making a meal of the poor projectionist. 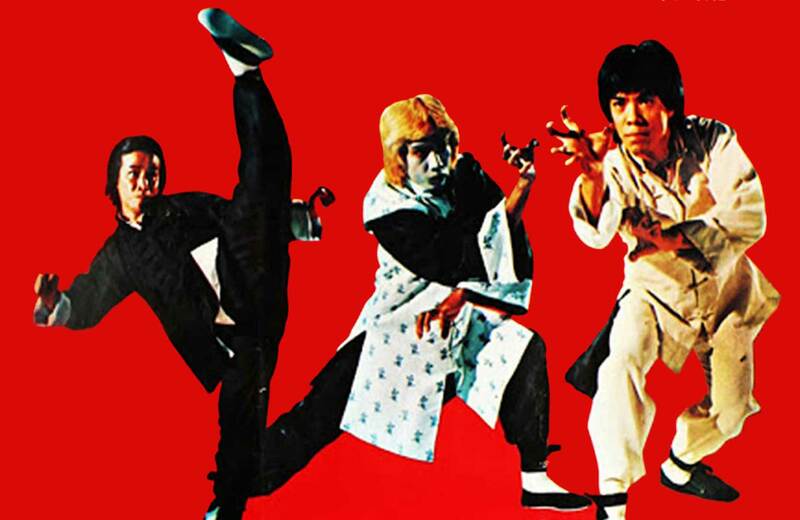 The structure of genre is first taken down, then the analysis of film, then the physical film itself. Like Godard, Dante seems to be declaring that he simply cannot kill cinema enough. Of course, this subversive deconstruction of all cinema isn’t the driving intellectual force behind Gremlins 2 – it’s more silly than anything, and could be simply content to exist as a living cartoon with a bunch of excellent special effects, funny gags, and amazing monsters. 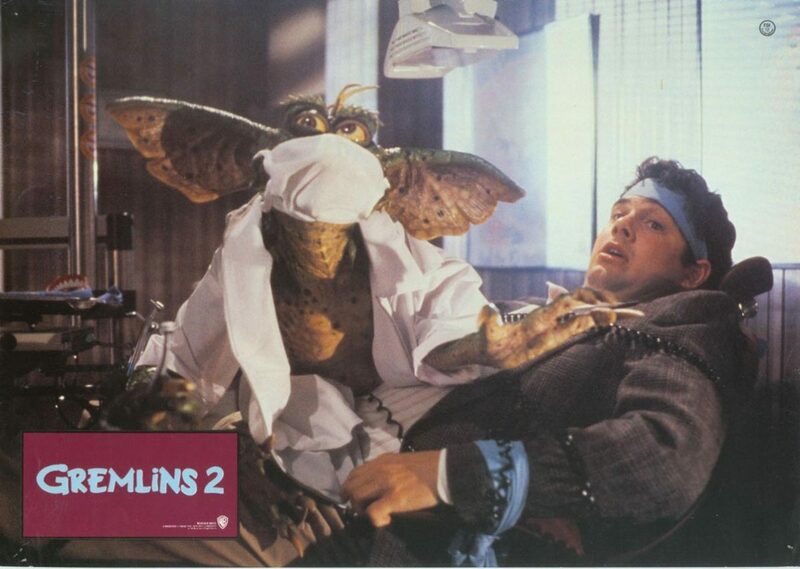 Gremlins 2 is anarchic little boy destruction, taken to the nth degree. It’s childhood chaos, being wielded to knock over convention. And that, in itself, is kind of brilliant.